It is most rightly said “She who leaves a trail of glitter is never forgotten”, and what better way to do this than to wear glitter nails. Glitter arty nails were a huge trend in the early 2000s and now they have made a major comeback. This time they are set to be a constant favorite in the fashion scene as people are obsessing over glitter nail art. Glitter for nails is a total fad this season and we couldn’t be more excited about it. 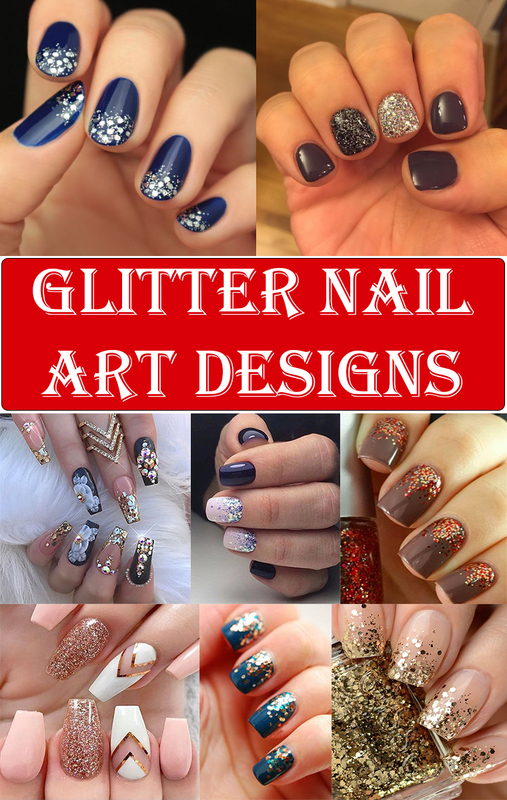 Glitter nail designs take your nail game to a whole different level as they add so much bling and oomph to your overall look if done properly. Almost every girl loves to have beautiful nails and glitter nail art designs can give the extra edge to your nails that brighten up your look and add some sparkles to the dull days. Glitter polish in a myriad of colors can easily be found in the online stores and even in the local cosmetic stores around you. However, perfect application of your best glitter polish may be a tedious task, as it may turn out looking patchy and uneven. There are a number of tutorials online to guide you through how to paint your nails and step by step nail art using glitter polish. In order to get perfect nail art designs with glitter polish in one go, it is advisable to apply a base coat of clear nail polish and then apply the sparkle nail polish of your choice as a top coat. You could either choose a matte glitter polish or opt for gel based nail varnish, based on the preference of look you wish to achieve, both styles can be used to create some spectacular glitter manicure. Glitter dust for nails can help you achieve unique and stunning creative nails with a multitude of nail patterns. The nail glitter dust is available in a wide range of colors and is as simple to use as it sounds. All you need to do is apply a base coat of any color and while the polish is still wet, take a pinch of the glitter nail powder and sprinkle it over the nail. You can also use nail art tools like nail art stencils and nail art brushes to create beautiful and intricate designs with the glitter powder for nails. If perfecting the nail designs with glitter is taking you forever, an easy alternative is using artificial acrylic nails. These fake nails are extremely easy to put on and there is a wide gallery of glitter acrylic nail art designs to choose from. You can get your dream nails by using some nail accessories like crystals and diamonds on acrylic glitter nails. These acrylic sparkle nails look bold, classy and will definitely grab the attention of your onlookers. These days more and more girls are opting for glitter gel nails over glitter nail varnish as the varnish chips off easily over a few days, while the gels stay intact up to 4 weeks and without damaging your nails underneath. You can use loose glitter for nails on the monotoned gel nails to create several cool glitter nail designs. These gel sparkle nails look like they are right out of a fairytale as they are so stunning and dreamy. Black has always been the most sophisticated and mysterious of all colors and when you add glitter to it, it looks all the more attractive. Black glitter nail polish is a common favorite of many. You can create galaxies on your nails or holographic nail designs with black nail glitter. The possibilities of sparkle nail art using black glitter are just too many to name. Pink nail art is definitely a favorite of most girls. Pink nails are bright, chirpy and extremely adorable, hence pink sparkly nails are a total yes for the girls who love their nails bright and beautiful. Pink glitter nail polish is available in a variety of its shades from blush pink to ruby pink. Hence for the summery painted nails, pink glitter nail varnish is a must have. Gold is such a rich and royal color that its mere presence makes any nail design look delightful. Gold glitter nail polish not only adds bling to your outfits but also matches with almost everything. Also, gold glitter nail varnish has this extra benefit that it can be worn alone or on top of another color to create some beautiful glitter nail art. Silver glitter nail polish looks so glamorous and suave, that it’s hard to take our eyes off it. It is definitely one of the best glitter for nails, as it looks amazing paired with any nail colors that can be found. Silver glitter nail varnish is ideal for any occasion, with any outfit and will always make your nails dazzle. Red is such a classic color when it comes to nail art, it is elegant, festive and complements every skin tone well. Red glitter for nails is amazing for a number of attractive easy nail art designs like hearts and flowers. When paired with different nail glitter colors like black, rose gold sparkle nail polish or silver, it can give some amazing fashion nails. Purple is such an understated color, it is royal, polished and charming. It is also such a great shade for the perfect glitter manicure. Purple colored chunky glitter nail polish when paired with white glitter nails it can be home to a myriad of glitter nail polish ideas. Dark blue glitter nail polish can be used to make magical galaxies on your nails or you could choose sky blue nail polish to create some dancing waves giving major summer vibes. Either way, blue is a great base for a number of glitter designs and using nail decorations such as nail decals, nail stickers and nail pens you can create a lot of variations of blue sparkly nails. The combination of white and gold is a super cute nail design and goes great with any clothes or jewelry combination. Whether you choose to use white glitter on golden nails or golden glitter nail varnish on a white base, the outcome will be gorgeous both ways. You can also opt for golden glitter tips on a white monotone base to give a more chic and edgy look to your nails. Black and silver are both extremely attractive and sophisticated colors and when you add their sparkly versions, the outcome is as gorgeous as you can imagine. A crazy bunch of magic nails can be created using the combination of these two colors. You can also create silver glitter nail tips with a black base to give an alluring look to your nails. The combination of pink and silver nail designs is perfect for the girly girl who wants to get some magnificent nail designs. As silver suits well with all colors, it makes the beautiful pink appear more striking and pretty. Glitter dipped nails in silver can be used to create some ravishing designs on a pink base. As we know, French nails will never go out of style, but over the years the conventional French nail art has become extremely common and boring. Monotoned white base with silver glitter tip nails is the new and upgraded French nails design. Glitter French nail designs are chicer, tasteful and highly flattering. Be it in hair colors, clothes or glitter nail paint design, ombre is so in right now. There are a number of ideas to create awesome sparkle ombre nails, after applying a base coat of any color you can use glitter dust for nails on the tips or only on the moons to create a fading effect. Gel sparkle nails are most popular in ombre as the high gloss is highly commendable. Matte sparkle nails can be used to create some stunning ombre effects too. Previous article34 Hacks That Will Change Your Daily Life! Next article10 Eyeshadow Hacks That Do Not Include Your Eyes! Like most people, I have a love/hate relationship with glitter nail polish. On the one hand I love it, because it turns my nails into sparkly disco..
Well no more, because nail vlogger Kelli Marissa has come up with a genius hack which cuts time and makes glitter polish look as amazing on..
First thing’s first: Here’s how to do an ombre effect with loose nail glitter. You can do it on the tips of your nails, or from the bottom up.